Speedway racing is know to have taken place in at least 5 venues spread across Bradford, most notably at the Odsal Stadium, home of the more famous Rugby League team the Bradford Bulls. It was at another venue, Fronby Avenue, that the first recorded meeting took place on 19th May 1928. 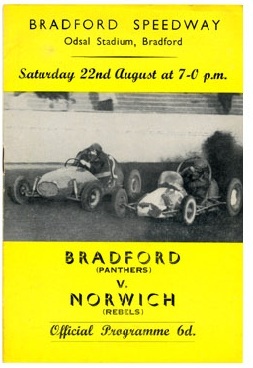 In that same year, but on 7th July at Greenfield Autodrome, the home of Bradford Northern Rugby League team, that another dirt-track meeting took place. The team won the Knockout Cup in four of the five years from 1992 to 1995, missing out in the year it won the Premiership title in 1994. The first meeting at Odsal Stadium took place on 23rd June 1945 which was witnessed by a crowd in excess of 20000. After that first year, when crowds remained high, the Club joined the National League and remained in it until 1956. It joined the British League Division 1 in 1991, the Premier League in 1995 and finally made the Elite League in 1997. The club have had a number of nicknames throughout its time, including the Boomerangs, the Panthers, the Barons, the Dukes, the Flying Foxes, the Badgers and the Northern.